The ESA615 Electrical Safety Analyzer brings fast and simple automated testing in the form of a portable analyzer to healthcare technology management professionals that perform electrical safety testing on medical equipment both in the field and in facilities. Whether it is simple testing or comprehensive analysis, the ESA615 can do it all. This multifaceted device performs all primary electrical safety tests, including line (mains) voltage, ground wire (protective earth) resistance, insulation resistance, device current, and lead (patient) leakage tests. It also offers ECG simulation and point–to-point voltage, leakage, and resistance tests. The ESA615 is an all-in-one solution with a multimeter, safety analyzer and ECG simulator in a single test instrument. - Optional Ansur automation software completely integrates medical device testing including electrical safety, visual inspection and other performance parameters for total digital data management. Tethers with other Ansur-automated test devices for harmonized workflow and reporting. 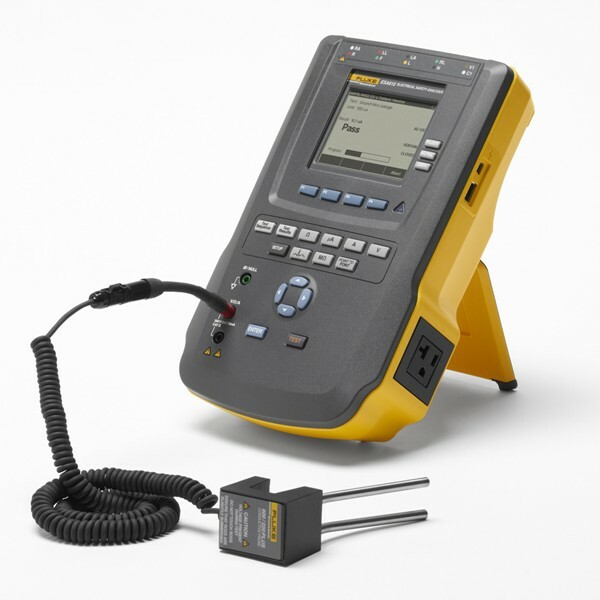 Click the button below to add the Fluke ESA615 Electric safety Analyzer to your wish list.